EuroJackpot is a multinational number lottery currently operated in twelve European countries. As the name of the game suggests, the jackpot is common for all the participating countries and can grow rapidly to sky high levels. The minimum guaranteed jackpot is €10 million. Until recently EuroJackpot has been played in these countries: Croatia, Denmark, Estonia, Finland, Germany, Iceland, Italy, Latvia, Lithuania, the Netherlands, Norway, Slovenia, Spain and Sweden. Since 4 October 2014 the EuroJackpot club was joined by the Czech Republic and Hungary and enlarged to 16 participating countries. Slovakia was supposed to join the lottery on that date too, but unfortunately the local lottery company Tipos had not received timely permission by local Ministry of Finance. Due to a necessary legislation change of their Lottery Act they are likely to become the participant number 17 during the year 2015. The players of the EuroJackpot lottery try to match five (5) main numbers out of fifty (50) and two (2) additional Euro numbers out of eight (10). There are twelve prizes in total based on the correct matches of the main and Euro number. To win the top prize it is necessary to match all five main or regular numbers and two Euro numbers. The draw takes place only once a week on Friday evening in Helsinki, Finland. Since 4 October 2014—the enlargement day by the Czech Republic and Hungary—the new rules were introduced. There used to be 8 Euro numbers in total, now it is 10 and still 2 numbers are drawn. This seemingly tiny change, as you will see below, almost double decreases the probability of hitting the jackpot or the main prize. A ticket or a betting line costs €2. This price can be perceived very differently in the participating countries due to their purchasing power. However it is compesated for by potentially massive jackpot that can reach up to €90 million. The jackpot and its division will be dealt with in one of the following chapters. 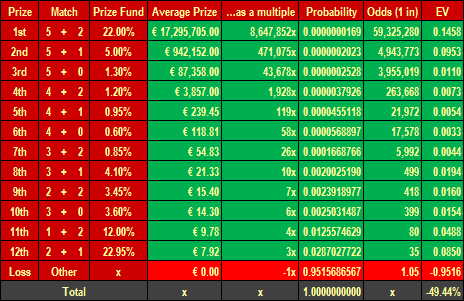 All important characteristics and calculations related to the EuroJackpot lottery are shown in the Table 1. The meaning of the headings is described in more details on the EuroMillions webpage. Let us just go through it briefly, so that we can quickly jump to the probability (or the odds) of winning the EuroJackpot top prize and to the long-term expected return from a player’s perspective. We can see that there are 12 Prizes and the related conditions that need to be met to get them (Match). For instance 5 + 2 means the necessity to match 5 main numbers (out of 5) and 2 additional Euro numbers (out of 2), of course, one cannot forget that there are 50 main numbers and 10 Euro numbers in total. The Prize Fund shows the percentage allocation for each prize. If you sum up the figures, you arrive at the value 88%. It may seem strange, but the remaining 12% is used as a guarantee fund. As for lotteries, traditionally the biggest part of the funds is allocated to the highest and lowest prizes, so that (1) the jackpots can grow quickly and (2) players are motivated to keep on betting (and aiming for the upper prizes) as they do not leave empty-handed all the time. The Average Prizes are published and updated after each draw by the lottery operator. Together with the probabilities they are used for the calculation of a player’s expected return (long-term average outcome) as it is addressed further in the text. The probabilities are shown in two formats: (1) decimally and (2) as the odds (one in …). In terms of lotteries there are usually very low probabilities (especially as regards the main prize) and therefore it is clearer to use the second format, the Odds. How many unique combinations there are in EuroJackpot? We know that there are 5 main numbers and 2 additional Euro numbers drawn in this lottery. We can easily use the Excel function =COMBIN(50,5)*COMBIN(8,2) and arrive at the result 59,325,280. This is the count of the total unique possibilities that can be created. And since there is only one winning combination of 5 main and 2 Euro numbers, the odds of winning the EuroJackpot are 1 in approx. 59 million. The odds of winning the other (lower) prizes are also shown in the Table 1. If we add them up, we get the probability of winning any of the prizes approx. 0.0484 (or 4.84%), in other words the odds are something between 1:20 and 1:21. The probability or the odds of winning nothing can be calculated indirectly by deduction from 1 (the total of probabilities must equal 1 or 100%). The odds of winning the main prize in EuroJackpot, and similarly in a vast majority of lottery games, are often quite low. At the same time it is possible to win one of the lower prizes, whose odds are growing (in the opposite direction). However the odds are not the only point of interest. It is also important to know, how much can we win. If we weight (multiply) possible prizes (and the loss of the bet as well) by their probabilities and add them up, we arrive at the average expected outcome of betting in the long run. The player’s expected outcome in the EuroJackpot lottery is -49.44%. This figure with the plus instead of minus is the margin of the lottery company (the player’s loss is the lottery operator’s gain). The player is going to be losing about 50 cents out of each wagered euro. As it was mentioned the EuroJackpot is raised by lost (or undistributed) bets. The minimum guaranteed jackpot is 10 million euros, the average jackpot is 17,295,705 euros and the maximum so far achieved jackpot has been 46,079,339 euros – source, as of 28 April 2013. Since 1 February 2013 the maximum jackpot is theoretically unlimited as the cap was removed. This is where EuroJackpot differs from EuroMillions, whereas the jackpot is capped, but is divided among the most successful betters in the final draw. Both means of jackpot handling can cause betting rush. In the first case the jackpot grows constantly until it is hit, in the second case, when the cap is reached the players know that the jackpot will be shared by those who will manage to match the second prize or the third prize (in case there were no winners of the second prize) etc. Other resources: www.hazardni-hry.eu/loterie/eurojackpot.html (original Czech article).